Motorola Confirms July 25 Launch Event; Moto Z2 and Moto Z2 Force to be Unveiled? - Playfuldroid! 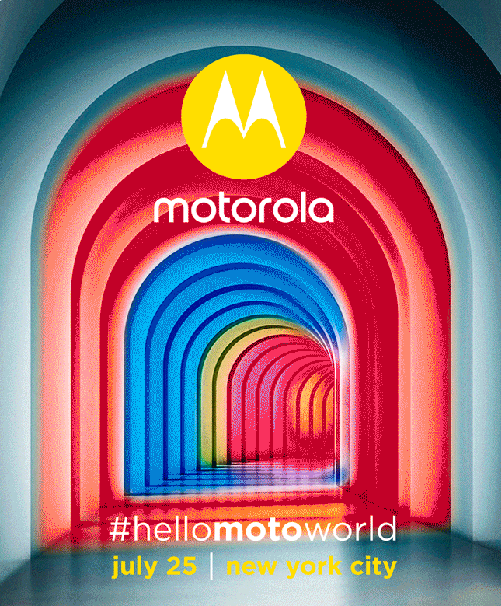 The media invites that have been sent out contains the text “you won’t want to miss this.” It carries an image of a color tunnel and it includes #hellomotoworld hashtag. The launch event will be hold on July 25 in New York City. The Moto Z2 and Moto Z2 Force are the upcoming flagship phones from the company. Last year, the Moto Z and Moto Z Force were launched in June. However, they were made available for purchase by September. Since it has been over one year since the launch of the original Moto Z and Moto Z Force smartphones, speculations are rife that Moto Z2 and Z2 Force flagship may get unveiled on July 25. The Moto Z2 was recently spotted on GFXBench which indicated that the company may be testing the phone before its official announcement. The Moto Z2 has also appeared on AnTuTu. These listings have revealed that the Moto Z2 would be equipped with a 5.2-inch Quad HD screen. It would be driven by Snapdragon 835 chipset and 4 GB of RAM. It will be coming with a 64 GB native storage. Its front-facing camera is of 5-megapxiel. It will be coming with dual rear cameras. One of its sensors will be of 12-megapixel. Last year, Motorola had not featured a 3.5mm audio jack on Moto Z and Z Force smartphones. Recently, an image of the AT&T Motorola Moto Z2 Force was spotted. It revealed that the smartphone will not be featuring a 3.5mm audio jack which indicates that even the Moto Z2 will not be coming with a 3.5mm audio jack. The Moto Z2 Force is expected to come with similar specs as Moto Z2. The Z2 Force will be equipped with unbreakable ShatterShield display which is unlikely to be present on Moto Z2. The Moto Z2 and Z2 Force are rumored to be available through all the major carriers in the U.S. The Moto X4 is also one of the smartphones that is speculated to get unleashed soon. The smartphone is rumored to debut on June 30, but newer information has revealed that its arrival has been delayed probably because Qualcomm is struggling to meet the demand of Snapdragon 660 chipset which is rumored to power the Moto X4 as well as various mid-range phones.